The Alen Air A375UV air purifier is designed to really clean the air in your house. 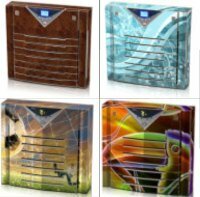 It has 6 different kinds of filters to purify the air in your rooms. This machine can clean dust, pollen, animal dander, smoke, odors, and VOCs. Are you looking for an air cleaner that can do all that? This machine tested well in independent test. It removed 98% of the particles in the air just like the Alen A350. Not a boring air purifier! Just like the A350, this unit can be mounted on the wall. This would free up more floor space. It also means you don't have to worry about kids or pets knocking the machine over and breaking it. Skins also allow you to change the way your machine works. It can be made to match your interior decoration. We think it is nice that you have the opportunity to change the color of the air purifier. Like the Alen Air A350, the A375UV is 18.5" X 8.23" X 17.5." It does weigh a little more coming in at just under 20 pounds. It is still quite easy to move this air cleaner around your house. The Alen A375UV is advertised as cleaning up to a 800 square foot room. For better results use it in a room 400 square feet big. According to the owners manual, there are 4 air exchanges per hour in an 800 square foot. This is pretty good. In a 400 square foot room, there will be more than 7 exchanges per hour. This is very good and more than our recommended 6 exchanges an hour. This air purifier uses a combination of 6 different types of filters. Each filter helps this air purifier to really clean the air. It has a pre-filter to remove larger particles. This will help the HEPA filter last longer. 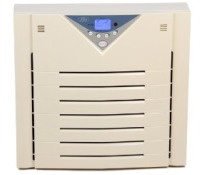 A HEPA filter which filters out 99.97% of particles down to 0.3 microns. An activated charcoal filter to remove odors. A ionizer that can be turned on and off. This is certified to be ozone free. It has, not 1, but 2 UV lights to kill germs, bacteria, and viruses. This can't hurt, but we wonder if the air is exposed to the UV light long enough for it to really work. It uses photo catalytic oxidation to remove VOCs from the air. VOCs are vapors from things like glue, formaldehyde, and some aerosols. Note: Exposure to UV lights can be harmful to humans. In this machine they are deep inside the machine. This protects you from accidental exposure to them. More information about these kinds of filters can be found on our Air Purifiers Filter Page. 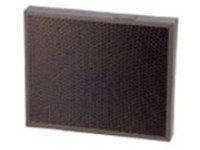 The pre-filter, HEPA filter, and activated charcoal filter are combined into one filter. This has to be replaced ever 6 months just like the Alen Air A350. This is part of the lifetime warranty. If it is not changed the warranty becomes void. The pre-filter is washable and can be cleaned whenever it is dirty. The UV light bulbs probably should be replaced every year. The ionizer and the photo catalytic oxidizer are permanent and will not need to be replaced. The Alen A375 filter is a combined pre-filter, HEPA filter, and Carbon filter. You don't have to buy multiple filters. The filter need to be replaced every 6 months. The filter cost about $60 dollars. Alen also offers a silver HEPA filter for the Alen Air A375UV. It kills bacteria, viruses, and other organisms. It is about $70. The third filter is a MCP Gas, Smoke, and Odor filter available for $90. It does a better job removing odors and smoke. The UV light Bulbs will also need to be replaced periodically. The cost is $60 for a set of 2. Just like most warranties, this is only good if you buy it from the company. If you're not the original purchaser, you will have no warranty. Here is what we like about the Alen Air A375UV. These are some of things we things we don't like. Here are some positive comments from people who own a A375UV. Not everyone likes these. Here are some of the complaints about this machine. In auto mode it can work at high speed in the night and wake you up. We feel confident about recommending the Alen Air A375UV air purifier to anyone. It will do an excellent job of removing allergens from the air. It also removes VOCs, germs, bacteria, and smoke from the air. It will do a great job cleaning the air in your house. The replacement filters are not expensive. It is easy to use and maintain. It also comes with a lifetime warranty. If it breaks Alen air will replace it. So you don't have to worry. We recommend this for everyone. No matter what you need filtered, this will do it. Since the ionizer is ozone free, even someone with asthma can use this. Leave Alen A375UV Air Purifier Page and Return to All About Air Purifiers Home Page.